News highlights from 2014 include (from left to right) the rededication of the Ogden Utah Temple, the release of the “Meet the Mormons” movie, the dedication of the Phoenix Arizona Temple, a new international Young Women general board, reconstruction efforts in the Philippines, and the first-ever general women's meeting. Church highlights from 2014 include news of temples, humanitarian aid, Church growth, and other major events. See another 2014 Year in Review on MormonNewsroom.org. Church highlights from 2014 include news of temples, humanitarian aid, Church growth, and other major events. The Church began a major building project in the Philippines as a result of Typhoon Haiyan, responded to the Ebola crisis in Africa, and served thousands of refugees in the Middle East. Church leaders dedicated temples in Fort Lauderdale, Florida, and Gilbert and Phoenix, Arizona, and rededicated the Ogden Utah Temple. New Young Women general board members pose in Salt Lake City Tuesday, September 30, 2014. Photo by Jeffrey D. Allred, Deseret News. At the conclusion of the Church's 184th Annual General Conference, President Thomas S. Monson asked the 15 million Church members across the globe to constantly nourish their testimonies of the gospel, “that they will be a protection for us against the buffetings of the adversary.” During the Saturday afternoon session of the conference, the First Presidency announced a new member of the Presidency of the Seventy, four new General Authorities, a new Sunday School general presidency, and 42 Area Seventies. Young women, girls over eight years of age, and adult women gathered, not only in the 21,000-seat Conference Center at Temple Square in Salt Lake City, but in meetinghouses worldwide for the general women's meeting. 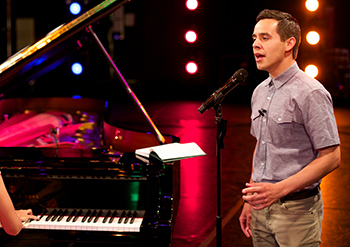 David Archuleta, an LDS singer, songwriter, and returned missionary, performs during the Church's first Face to Face interactive event for youth on Facebook. During his address at the BYU Campus Education Week devotional on August 19, Elder David A. Bednar of the Quorum of the Twelve Apostles urged Church members to flood the earth with gospel messages of truth. Director Blair Treu is interviewed as media talk with the international cast and crew members of the film Meet the Mormons in Salt Lake City Tuesday, October 7, 2014. Photo by Jeffrey D. Allred, Deseret News. Pope Francis greets President Henry B. Eyring in the Synod Hall at Vatican City as the colloquium on marriage begins. © Chris Warde-Jones/Humanum.it. Elder Dallin H. Oaks, other General Authorities, Mexico City MTC officials, and several of their respective wives pose on the grounds of the historic MTC campus in Mexico City. Photo by Barbara Morgan. Elder Jeffrey R. Holland poses with members in Bangalore, India, during a visit to Asia February 19-March 2, 2014. Photo by S.V. Sunil. Sister Kathy Andersen and Elder Neil L. Andersen greet members during their visit to Tonga. Elder Russell M. Nelson and Elder Neil L. Andersen, both of the Quorum of the Twelve Apostles, accompanied by their wives, visited the Pacific Area February 12-24. Photo courtesy of the Pacific Area. Elder Dallin H. Oaks of the Quorum of the Twelve Apostles greets members during during his visit to the Philippines October 23-November 1. President Thomas S. Monson and Elder Kent F. Richards of the Seventy and director of the Church's Temple Department pause for a moment prior to entering the temple as they rededicate the Ogden Utah Temple Sunday, September 21, 2014. Photo by Scott G Winterton, Deseret News. President Thomas S. Monson greets children gathered for the cornerstone ceremony of the new Phoenix Arizona Temple. President Monson dedicated the temple Sunday, November 16. Photo by Sarah Jane Weaver. Bishop Gary E. Stevenson lends a hand constructing new houses in Tacloban, Philippines. Astrid, 13, left, and Sarah, 13, work with members of the Beirut Branch to compile food boxes for LDS Charities. The food was distributed to Syrian refugees who have fled civil war in their homeland. Photo by Sarah Jane Weaver.